buildings of any kind have been in continuous use for longer. As you approach the church, look up at the porch where you will see a row of roman tiles running horizontally around what was the porticus, or entrance, to Wilfrid’s seventh century church. And the structure is still supported by the massive ‘long and short’ stone corners, which are so characteristic of Saxon buildings. The extent of the Saxon gable may be seen below the flint which was added when the structure was later converted into a tower. The remains of Wilfrid’s building may be seen by following the line of the tiles and the characteristic limestone blocks. The wall to you right is the Victorian south aisle. 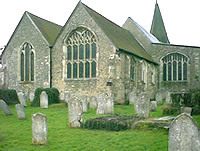 Once inside, the shape of the Saxon church may be seen from the remains of the course of Roman tiles. Look above the rood screen which divides the chancel and nave. Wilfrid built a rectangular church of great height. Look for his window above the modern paintings of Christ and the fisherman on the west wall. You may like to wonder why the church was so extravagantly tall – to the glory of god and to reach out to heaven? There is a charming modern embroidered picture on the wall to the right of the alter which captures the moment of the arrival of St Wilfrid in 680. And there is an excellent display in the south chapel which clearly shows the development of the church from Saxon times until the present. Christianity came relatively late in the Meon Valley. The Meonwara were amongst the last in England to be evangelised. We have heard about God’s love for us and Jesus’’ sacrifice for us since we were children. Imagine Wilfrid standing in front of you now and telling you about Jesus for the first time. How would you feel? How would you respond?